Reply for 'Mr Redpath about Mrs Hogarth', and also her son, Mr Hogarth, both of whom suffer from fits of flatulency. Cullen provides dietary and exercise and prescriptions. Mrs Hogarth's ailments are partly attributed to her age and anxiety, while her son is described as corpulent. 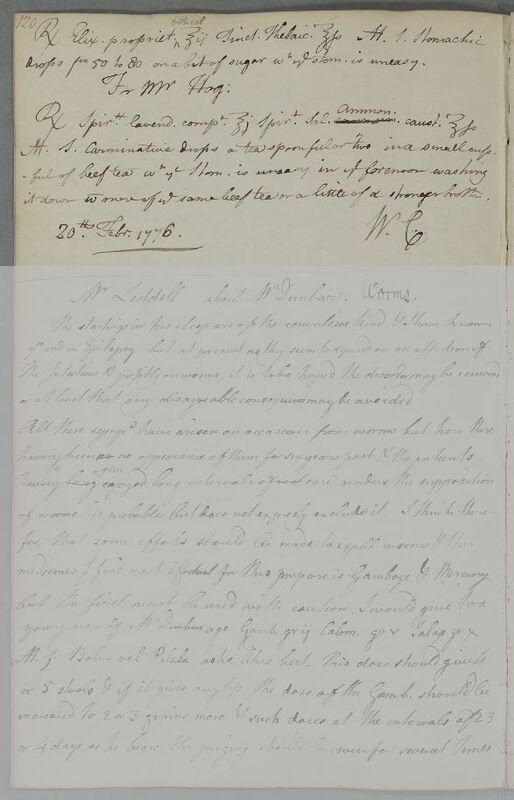 Summary Reply for 'Mr Redpath about Mrs Hogarth', and also her son, Mr Hogarth, both of whom suffer from fits of flatulency. Cullen provides dietary and exercise and prescriptions. Mrs Hogarth's ailments are partly attributed to her age and anxiety, while her son is described as corpulent. Case of Mr James Hogarth being treated for a 'nervous' complaint which includes stomach pain. Case of Mrs Hogarth, whose flatulence is related to age and anxiety. Mr. Redpath, about Mrs. Hogarth. stantly before her, her cure very difficulty but we must try &ccc. the common Elix. propriet. because I suspect you have not the Elix. propriet. vitriol. as in the latest edition of the Edinburgh Pharmacopœia I shall provide it for you. noon seize him take the medicine ordered below. Take ten grains each of ground Columbo Root and of prepared Rust. 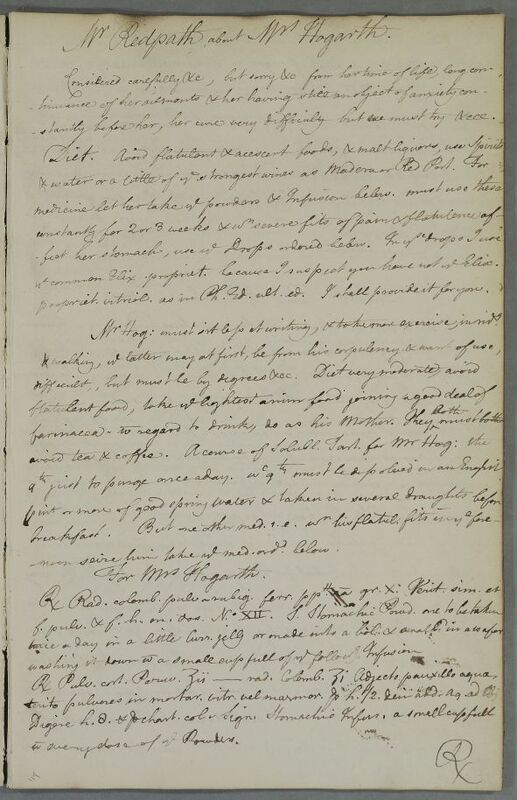 Rub together to make a powder, and make in this way twelve doses. Label: Stomachic Powder. One to be taken twice a day in a little Currant jelly or made into a bolus & swallowed in a wafer washing it down with a small cupfull of the following infusion. Take two drachms of ground Peruvian Bark and one drachm of ground Columbo Root. Having added a little water, rub into a powder in a glass or marble mortar for half an hour, then add up to a pint of water. Steep for eight hours and strain through paper. Label: Stomachic Infusion; a small cup full with every dose of the Powders. Take two ounces of Proprietary Vitriolic Elixir and half an ounce of Thebaic Tincture. Mix. Label: Stomachic drops; from 50 to 80 on a bit of sugar when the stomach is uneasy. Take one ounce of compound Spirit of Lavender and half an ounce of Caustic Spirit of Ammoniac Salt. Mix. Label: Carminative drops; a teaspoon or two in a small cup of beef tea when the stomach is uneasy in the forenoon washing it down with more of the same beef tea or a little of a stronger broth. ye common Elix. propriet. because I suspect you have not ye Elix. propriet. vitriol. as in Ph. Ed. ult. ed. I shall provide it for you. Mr. Hog: must sit less at writing, & take more exercise, in ridg. noon seize him take ye med ordd. below. washing it down w a small cupfull of ye followg. Infusion. w every dose of ye Powders. drops fm 50 to 80 on a bit of sugar wn ye stom is uneasy. it down w more of ye same beef tea or a little of a stronger broth.